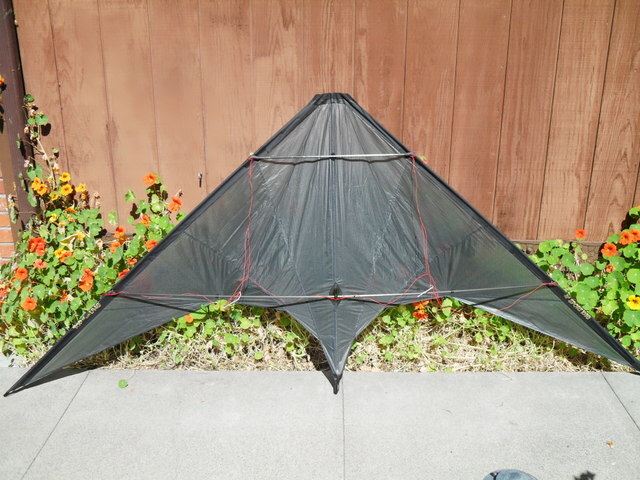 I discovered a long forgotten North Shore Kona sail while going through my kite stuff. It appears to be unflown. I already have a very lightly framed Kona as well as a Radical and a VIP, so I want to build this one for moderate wind, meaning too much for the UL and not enough for the Radical. I'm thinking Skyshark P200 leading edges and top spreader, P300 spine and I'd like to use Avia G-Force standard spreaders that I seem to have stocked up on for some forgotten reason. The sail looks like this one. It's 1/2 ounce nylon. You guys aren't very helpful! The parts should be delivered today. I'll let you know how it turns out. and thought of doing a reframe. No one can help because no one has done this. You are in new territory sir. David, sorry I didn't see this sooner! I've never fiddle with an NSR. The one thing that springs to mind from re-framing a number of early '90s straight LE precision kites is that sometimes a frame can be too stiff. I put all P300s in a Chicago Fire Bee and it was never any good, P200s were great. It was all about the flex, especially the spreaders. In that case punch turns just never got punchy. the kite felt dead. You may find the super stiff GForce spreaders overkill. P300 spreaders might be better, or even P200. Keep in mind how much stiffer even a P200 is compared to what was original used in these kites. Never did get a change to fly the Kona here in Las Vegas Missed our flying nights with school work. I reframed my Hawaiian with P300s and love it. Flew Gamelords NSR with stiff rev rods. Very very nice. Currently reframing my NSR with nitro rods. No added weight from the exsting .240 carbon rods. Enjoy the stiffer frame the Nitro gives on my WM and Mongoose. So I hope it turns out well for standard winds and increase the upper end. What are you reframing the Kona in? but this was just a nickname. The spine was the next stiffest tube. These tubes performed great but if you even looked at the 1 wraps wrong they would break. and weighed about 13gm. It was our favorite kite. best I have ever used. Curious as to how you like it. I'm concerned that the P200's won't be stiff enough for those straight (Slightly concave with the shorter spreader used for precision.) leading edges. Emmalee tends to punch hard for precision turns. I think that's the result of the tutoring that Brian Champie gave her. She dislikes the UL Kona because it's "too bendy". I wish I had ordered the stiffer P2X rods. The bridles I use on these are based on the dihedral active bridle that Andy Wardley made for the Benson Phantom Elite. I flew the kite today in gusty, bumpy wind at the local school yard. Precision is good, but I don't care much about that since it's only important if you are competing. It tends to begin to fall out of the sky before axels go all the way around. I think the problem is momentum because the LE's are too light. I'm going to try adding weight at the LE connectors before I spend any money on rods. I'm also rethinking the bridle. There's no reason for such widely spaced tow points if precision isn't important. As it is, huge hand movements are required. In case you haven't figured it out, I love tinkering with kites. Well, i hope you do realize that the kite was NOT designed to do any tricks. Since it is older then about all tricks. It is a precision machine, nothing more nothing less. That's not quite true, but it's limited to old school flat spin tricks. My daughter was doing axels with her NSR the first time she flew it and she was only 13. It will do slow 540's, but it loses a lot of altitude. It's very good at side slides. I've never been able to snap stall it the way she can. We've been flying the NSR for 12 years now, so we're familiar with its strong points and its limitations.